Noah: How was swimming today, my little mermaid? Erin: Awe, that's sweet. Although in my getup I look more like a wet seal. Seriously, you three should get your own reality show. Very hot. The swim cap really ties it all together. I agree with Slamdunk...that cap needs some sassy verbiage. Seth H—Good to hear from you dude! I was thinking about your comment last night, wondering what kind of drama I could cook up for a reality show. 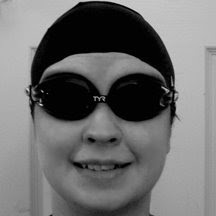 Costume Dive & Jen—The swim cap IS a little painful (emotionally, as well as physically). Kenna—Thanks for returning the visit! I detect twerpiness in his reply. Anonymous Dad—I will consider your suggestions. Sal—You're a quick study. Almost everything my dad says has a trace of twerpiness in it. No drama necessary. Just a lot of witty banter.